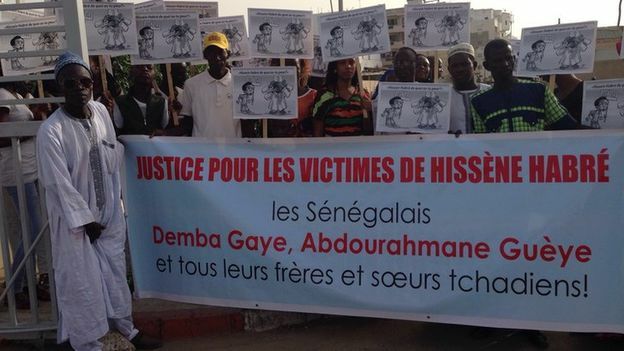 Oliver Windridge joins JiC for this timely guest-post on the role of victim groups in pushing for the prosecution of Hissène Habré. Oliver is the founder of the ACtHPR Monitor, a website and blog dedicated to the African Court on Human and Peoples’ Rights, which you can follow on Twitter here. The trial of the former Chadian leader Hissène Habré begins today at the specially constituted Chambres Africaines Extraordinaires (CAE) in Dakar, Senegal. Habré faces charges of crimes against humanity, war crimes and torture, crimes that allegedly took place in Chad during his tenure as the country’s president (June 1982 – December 1990). Let us be clear: this trial would not be taking place without the vital work of the victims of Habré’s reign. From the outset, they have constituted a highly organized campaign group and doggedly pursued accountability. The Habré trial therefore serves as a fascinating and important example of a victim-lead campaign for justice at state, continental and international levels and provides a positive example of a successful campaign by victims group seeking accountability against its leaders. This post seeks to explore the approach taken by the Habré victim group, which is made up by the The International Committee for the Fair Trial of Hissène Habré, a coalition of the victims, along with the leading human rights groups in Chad and Senegal, Human Rights Watch, and the Fédération Internationale des Ligues des Droits de l’Homme. How will this victim-led approach affect the Habré trial and how can the unstinting efforts of the Habré victim coalition be used to encourage future cases in Africa and beyond? As recounted by Reed Brody of Human Rights Watch, the paths taken by the Habré victim coalition to arrive at today’s trial includes domestic prosecutions in Senegal and Belgium, as well as cases before international tribunals and committees including the UN Committee Against Torture, the International Court of Justice, the African Union’s Committee of Eminent Jurists and the ECOWAS Community Court of Justice. While it should be acknowledged that this trial also owes a great debt to the hard work of Chadian and international NGOs within the victim coalition, it is no exaggeration to say that, without the tireless persistence of the victims themselves, the trial of Hissène Habré would not be taking place. That the Habré victims, with support from international NGOs, did so much of the heavy-lifting and, crucially, did so with a real sense of ownership of the case demonstrates how alleged victims of serious international crimes such as genocide, crimes against humanity, war crimes and torture, all of which are contained in the CAE Statute, can bring those accused of perpetrating mass atrocities to trial despite political and legal barriers as well as successive setbacks. Faced with these obstacles, flexibility through a sense of ownership of the case has been key to the ultimate success of victim coalition. Although I am sure the victims would have preferred immediately achieving a trial of Habré, where they were faced with defeat or a dead-end, the victim coalition was able to pivot between domestic and international, tribunals and committees, in order to keep alive their pursuit of accountability. Setting the victim coalition at the fulcrum upon which the campaign for justice pivots meant failure to achieve the aim of accountability in one court or tribunal did not affect the ability of the groups to make further decisions on litigation strategy, the collection of evidence or to petition another court or tribunal. This stands in stark contrast to the institutional processes of handing over materials and painstakingly gathering evidence for investigation by a permanent institution such as the ICC, where the victims have a much reduced role at the investigation stage and possibly lack the same sense of ownership. Here, flexibility looks attractive but it is worth bearing in mind that the reason why the Habré victim coalition needed flexibility to toggle between courts and tribunals was a lack of success. Compare this with handing over the case to an investigation at an international criminal tribunal. Yes you lose a degree of ownership over the matter, but at least you know the institution is capable of prosecuting the matter – something the Habré victim group was never able to rely on. Put another way, the victim groups approach used with such effect by the Habré victims allowed the victims to handle the wheel and steer the ship in the direction they considered best. With a tribunal or court as captain of the ship, the victim groups would have to be content with a second-class berth and to allow the ship to be steered in the direction the permanent tribunal or court – and not necessarily the victims – consider best. Until now, the Habré victim coalition has controlled the ship. This leads us on to my second point: what happens to that control and ownership when you succeed in reaching your destination of accountability? As mentioned above, the Habré victim coalition can quite rightly claim ownership of the campaign and the resulting victory of seeing the CAE established. But what now? The astounding success of the Habré victims in navigating the sometimes seemingly impossible waters of international law have lead to this ultimate destination: the independent trial of Habré in Senegal, starting today. Importantly, though, the desired destination for the victim coalition should not be confused with the starting point for the trial process itself. It remains to be seen how the Habré victims respond to the opening of the trial today when the matter is truly out of their hands and will be beholden,quite rightly, to the independent CAE headed by former ICTR judge Gustave Kam of Burkina Faso alongside senior Senegalese judges. There is nothing to indicate that the Habré victims will not feel a sense of great accomplishment and look forward to seeing a fair trial take place. But, having come this far and battled to take the matter to its final destination, the victims must nevertheless accept a more limited role and allow due process and the fair trial of Habré to take place. This due process does include the victims participating as civil parties, but they will now correctly be one party amongst several. That the trial must be independent, and uphold all fair trial rights recognized at international and domestic levels should not be in question. The trial may result in convictions, but it may not. Accountability has been achieved, but this does not necessarily lead to a finding of culpability. However, irrespective of whether Habré is convicted or acquitted, ultimately the victim coalition’s greatest success is getting to the point where they can hand over the reigns to an independent judicial institution mandated to try Habré. The interplay between a tribunal’s creation and its alleged victims has never been as close as it is with the Habré trial. It is arguable that Habré would have thought the least of his worries after leaving office were the victims he so casually discarded during this reign. But he was wrong. It is the victims who have endured. What is clear from the creation of the victim coalition is that, to endure, victims of mass atrocity need resilience and huge tenacity to pursue accountability. Ultimately, it is the creation of the tribunal itself and the imminent trial of Habré that should be seen as the success, whatever the eventual verdict of the court will be. The views expressed herein are those of the author alone and do not necessarily reflect the views of the ICTY or the United Nations in general. This entry was posted in Chad, Guest Posts, Hissène Habré, Human Rights, Justice, Senegal, Special African Chamber (CAE) and tagged Oliver Windridge. Bookmark the permalink. Great blog, right up my street. You are welcome to check out mine. Daniel.